With over 15 years experience within the industry and with thousands of pop-up instant shelters/marquees/party tents sold by us every year we are very confident in saying that we are one of the biggest specialists for instant pop-up shelters, marquees, party/event tents and other related products in the UK. With over 3,000 square feet of storage space fitted throughout with high-bay racking, REDX International Ltd has the largest stock of mini marquees, instant pop up shelters, party/event tents and accessories in Europe. This means any order placed before 3pm is received by the customer on the next working day. All our deliveries to UK mainland addresses are free of charge. We developed a full range of instant shelters from the long successful 'Swiftshade' units to our new XTR7 Extreme Performance pop up shelter, which is without doubt the best value industrial unit on the market. 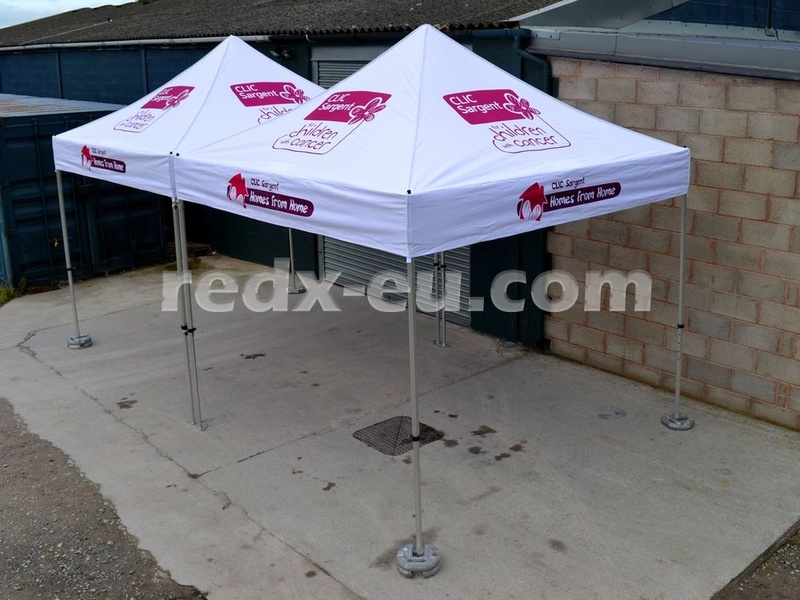 Distribution and production of pop up instant shelters/mini marquees in the UK started in the 1980s when several companies realised their importance and business potential. Today the instant pop up shelter/mini marquee turnover in the whole UK is worth around 50 million GBP. And we are proud to be one of the leading suppliers and our share in this market is still growing as we offer an unrivalled variety of sizes and colours in several different quality ranges. Our goal has always been to supply the best value for money shelters/marquees and our success has been built by developing one range of instant shelters purely for leisure use named as Heavy Duty Instant Shelters, another range for occasional professional use called Commercial Instant Shelters and last but not least our range of professional marquees called XTR7 Extreme Performance Instant Shelters. The XTR7 Extreme Performance Instant Shelter range took us several years to develop and its design is based on our longterm research of the pop up shelters market and feedback from thousands of our customers. This range offers a unique blend of many qualities. We managed to combine its unprecedented strength with more than reasonable portability. This was achieved by using the highest quality aluminium and opting for hexagon profile. Where you normally would find rivets and plastic joints on similar products these we replaced with nuts and bolts and cast alloy joints respectivelly. We are very confident to say that it is one of the strongest instant shelter frames on the market. Accompanied by 550g canopy this is the ultimate pop up shelter. Yet our prices are below prices of many lesser products available from our competition. It is therefore no surprise that the XTR7 Extreme Performance Instant Shelters have become the most important part of our portfolio and now represent almost 70% of all our sales. Needless to say many have tried to copy these instant shelters but without success. Nevertheless we would like to warn all our customers to avoid such lookalikes as they do not match our specification and in most cases do not even come anywhere near! Make sure you buy only genuine XTR7 Extreme Performance Instant Shelter.